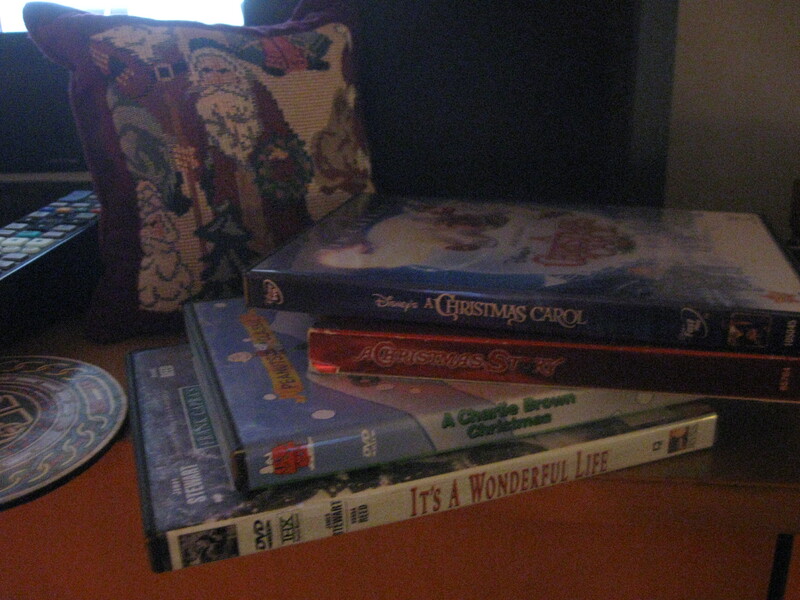 The dvds lie skewed in the cabinet, the christmas movie line up almost finished. It is our family tradition to make merry in fantasy, humor and good storytelling in film. 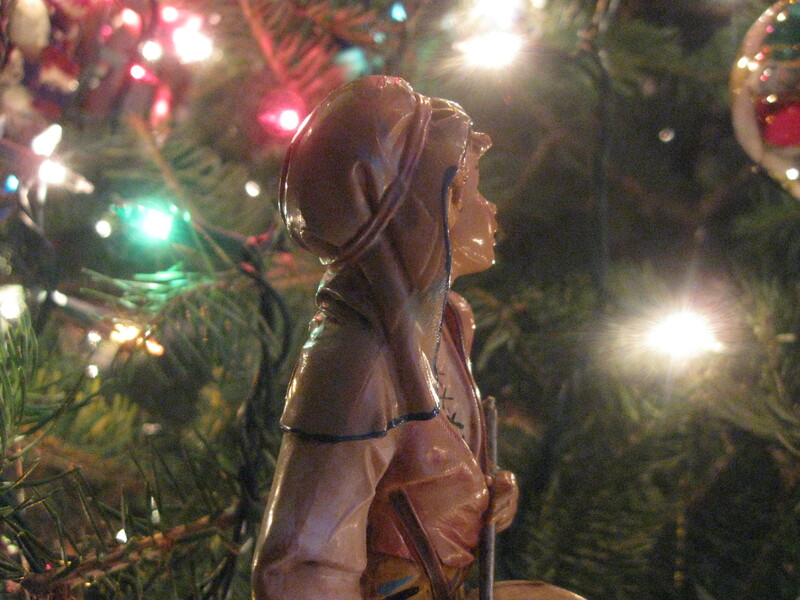 We laugh at a grown up elf, take away life lessons from Dickensian puppets, and ponder a life wonderfully lived. 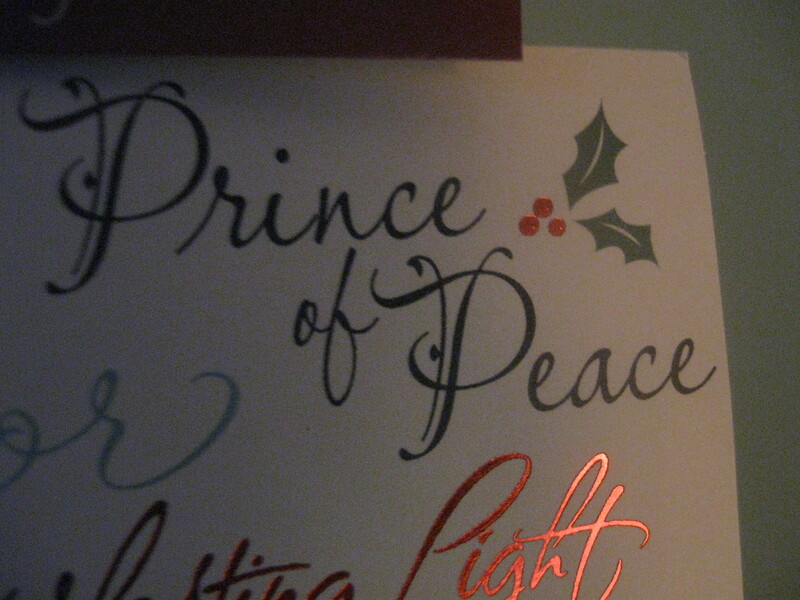 We end it in animation by remembering what Christmas is all about. In the middle of our line-up there are two stories, one rough, rude; the other proper and sentimental. The first tweaks those who find the humor inappropriate. The second tweaks those who find the sentiment unrealistic. I understand, but I don’t watch them for the humor or the sentiment. I watch them for what happens in the end. In the first story, the son, a little boy, is given the gift of his dreams, despite the fact that everyone around him promises he will shoot is eye out. Yet, it’s the father, a seemingly clueless and crass man who knows what is in his son’s heart, what will give him the most pleasure. It is the father whose face breaks sheer joy when he watches his son tear the paper, break open the box, dispense the BBs. In the second story, the son is a self-conscious adolescent worrying about his future in Depression era Virginia. He aspires to be a writer, but is embarrassed to share his dream with anyone, least of all his parents. Yet, it’s his father, who is unable to be present most of the time due to work, that somehow knows what’s being birthed in his son’s heart. He comes bearing the gift of writing tablets. The endings of these stories get me every time. It is because I am hard-wired to be loved like that. We all want a father who knows our heart’s cry. We want a father who knows what we need when we need it. We go humble and contrite, but our hearts explode great joy when we realize we didn’t even have to speak our ache, our fears, our hopes, our desires… He just knows. These stories are visual aids for me. 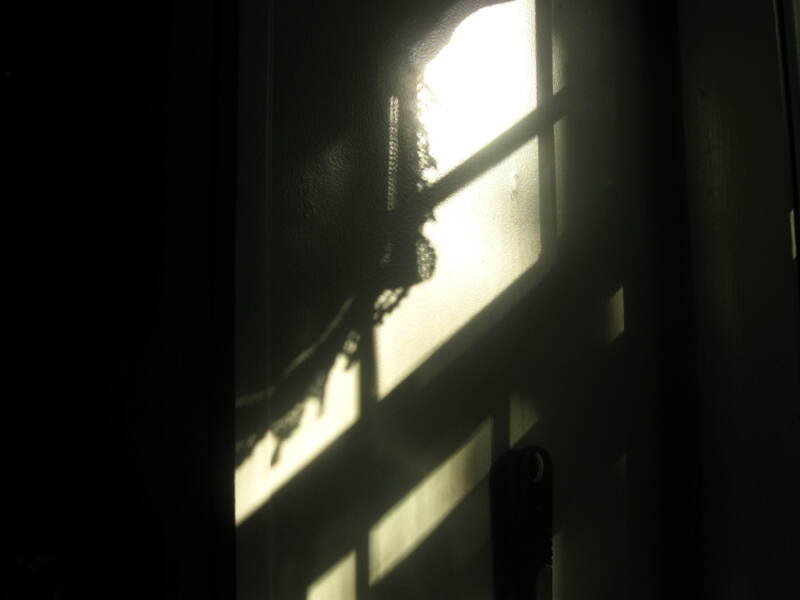 They are sad shadows, really, of the real thing, but sometimes the shadows are all we can see through the details of our life. I need reminders that I have been given a gift come screaming in a feed trough. I need reminders that I do have a Father that knows the ache of the human heart and that He’s come out of the shadows to fix it for good. Good news has been shouted. Darkness has received the fatal blow of a glorious light, a wrapped and swaddled gift that only a Father could know we needed. A son has been given. This new beginning gets me every time. She’s eight and she’s the only one who sees the yellow hearts on the floor. She drags her backpack through a pile of scrap paper dropped from an earlier cutting project and suddenly stops. Her feet plant hard and she lowers her head toward the floor. 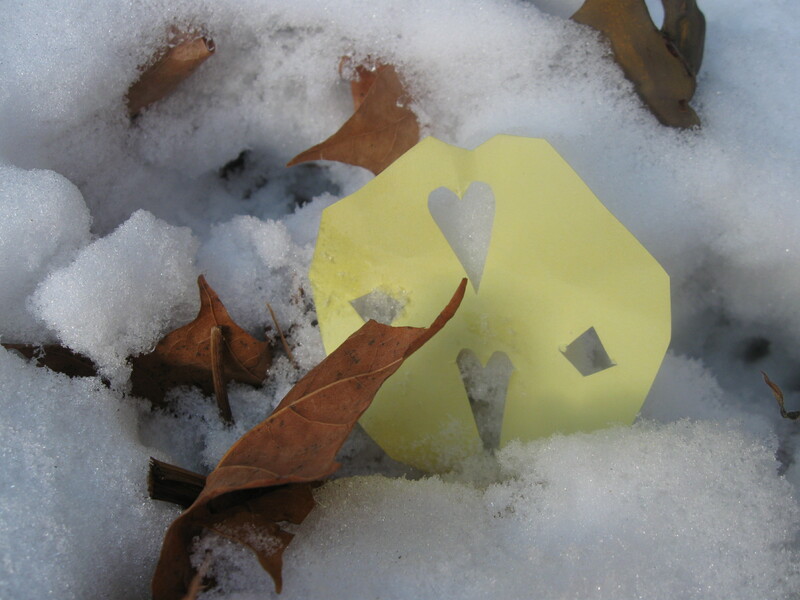 She reaches down, her winter coat baggy around her arms, and she picks up a piece of yellow paper, bent, little, heart shaped. She stares at it pressed between her thumb and index finger. She looks over at the kids next to her. Her girl voice speaks low. Rasped. Lisped. 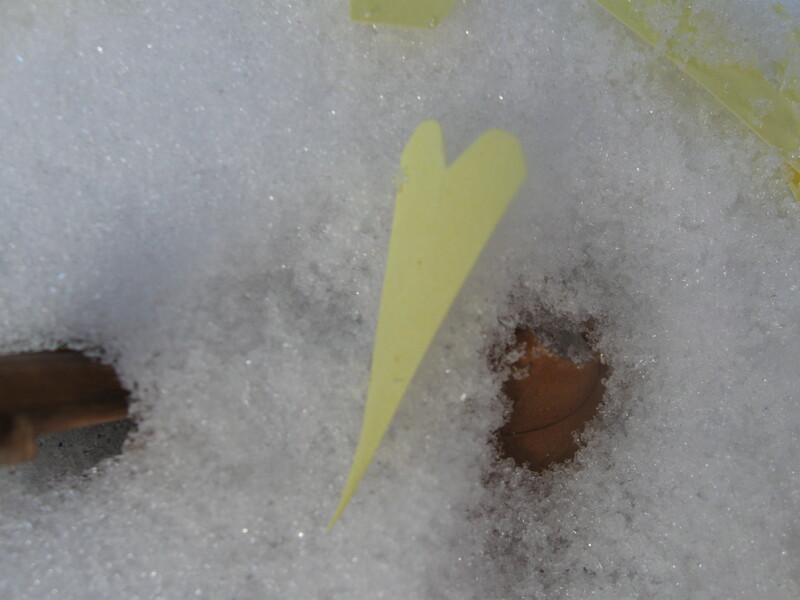 She bends down and picks up another yellow heart. She steps towards her friends. She holds one of the hearts up to the light and smiles. 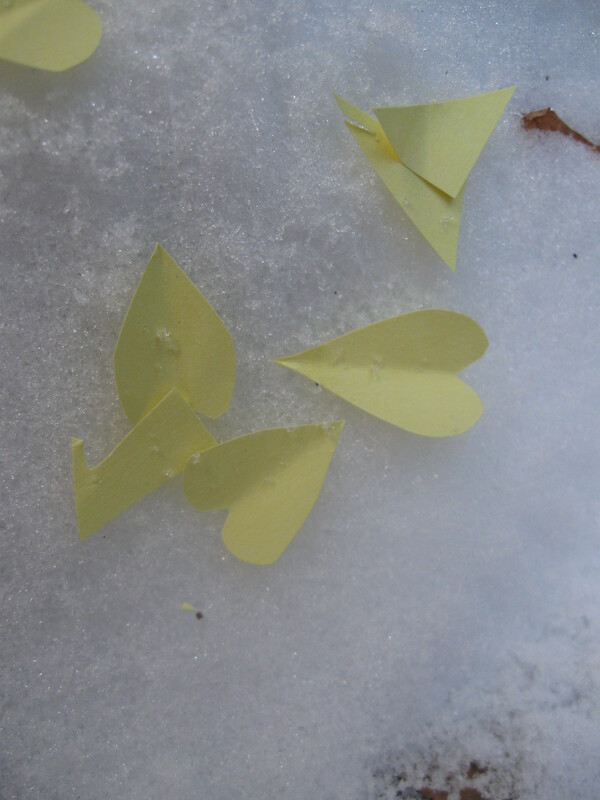 Accidental yellow hearts spilled on the floor destined for the trash are not plainly visible to everyone. You have to get low to see beauty in shards. You have to hone in to see what was cut away and dropped. 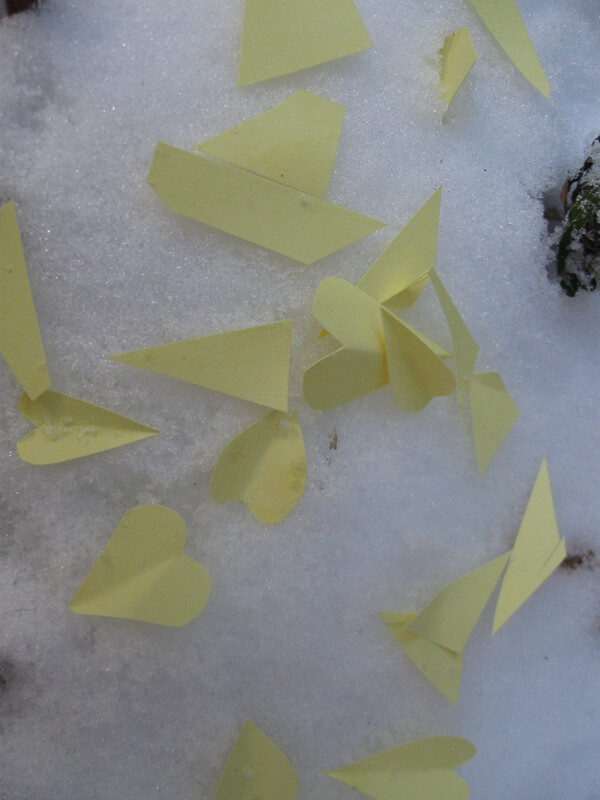 The girl goes back to the pile and picks through the shreds and finds the rest of the hearts. She makes a pile of them on the desk. “See,” she says to the boy sitting there. I am blessed in that moment to witness marvel take over a little boy’s face. Some people are hard-wired for beauty and mystery and intrigue. They are the ones that see light reflecting on the wall and wonder about the color and the shimmer. Some people keep pushing the button on the water fountain because when the water swirls round and round and round they can actually see life in it. 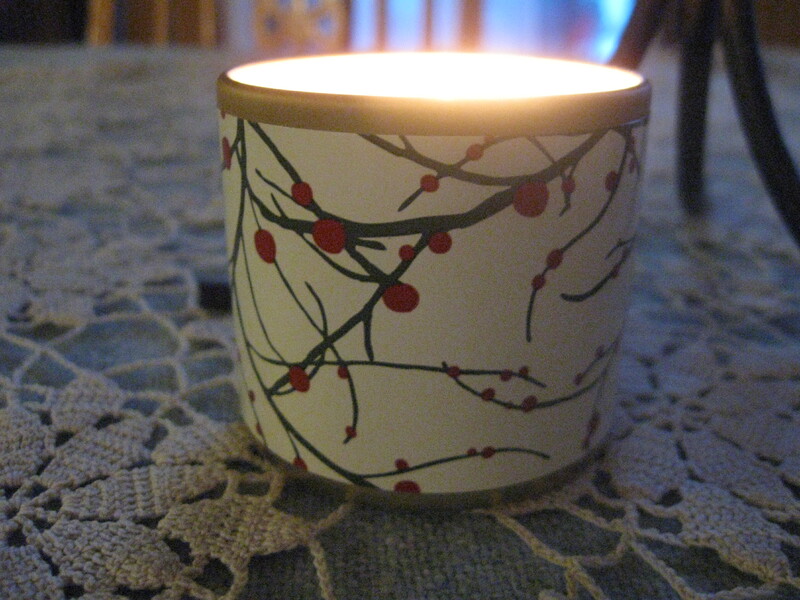 To quote a line from “Finding Neverland” just is a horrible, candle-snuffing word. Anything that diminishes the beauty, the wonder, the marvel of this life may as well be lights out. Jesus was just a baby born in feed trough obscurity. All that harking and heralding angels do is just a Christmas song, not some cloud-rending, open heaven event that shook some sleepy shepherds out of their normal routine. Is this what happens when we demand to know, to understand with proof before we can believe? Is this how we justify just? Did it become just an angelic visitation that left an old man priest speechless because he had to know? But the girl Mary never let an angelic visitation lose its majesty by wanting to know; she only asked how because she was caught up in the wonder. She believed a womb could be breathed upon. She believed a poor, unmarried, untitled, obscure maiden could carry the Creator of the Universe if He wanted. She believed within the wonder. Poor Zechariah. A good man. A man who loved God. A good priest who forgot the wonder for a moment. 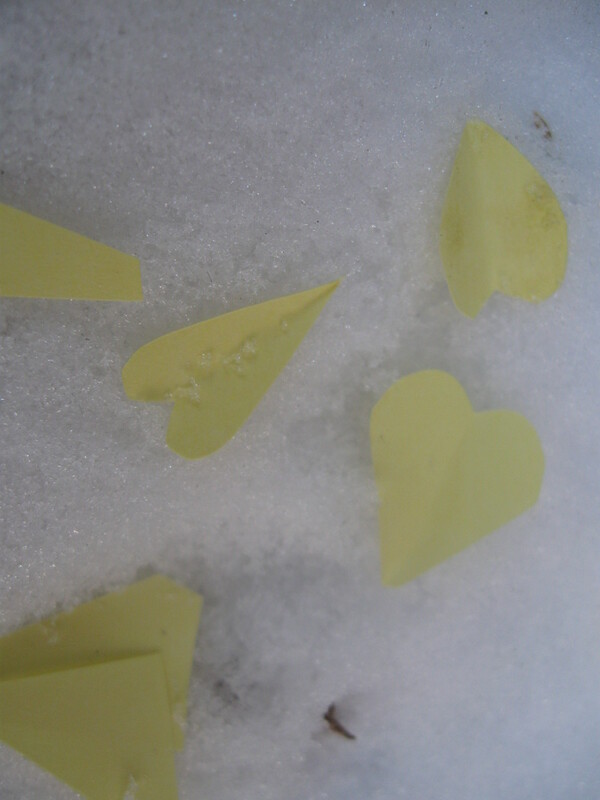 He couldn’t see past the scraps of reality to the yellow hearts hidden there. The girl gathers the yellow hearts and makes a pile on the desk. She’s told to hang up her things because now she is very late. She walks over to the coat rack, but before she gets there she stops. She plants her feet hard. She looks up toward the ceiling. I can’t see what it is that she is looking at but for the second time that morning I see marvel come over a child’s face. It’s a wonder, is it not, that God comes to stables? It’s a wonder, still, that He comes to third grade classrooms.